We’re often called in after new construction to create and install new landscape designs. Construction crews try their best, but damage to trees, shrubs and garden beds during a major (or even minor) renovation is inevitable. Here are some preventative measures you can take to minimize any damage. Be sure to get your landscape designer involved before the builders begin! We’ll work with your builder to devise a plan to protect any existing plants. Heavy equipment, such as bobcats, backhoes, even dumpsters, compact the earth with their weight, squeezing all the oxygen out of the soil, crushing its natural structure and leaving us with a cement like surface with poor drainage. This kind of condition, called ‘compaction’, threatens the health of our trees, garden beds and even lawns. Bigger trees need bigger precautions. Be sure to fence off your trees at least as wide as their drip line - this will help protect their root systems. 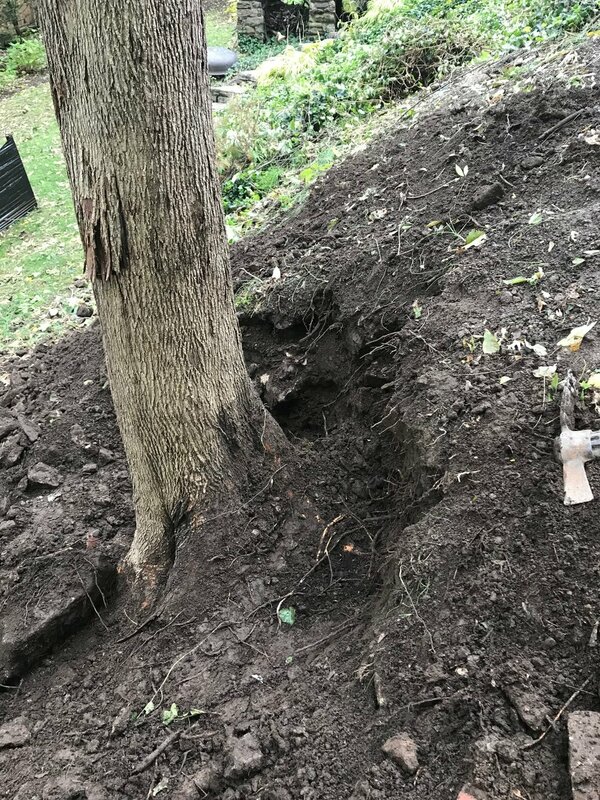 There are protocols to be followed when it’s not possible to fence off large trees, like adding 2’ of mulch (shredded hardwood) to the root zone so roots and soil are cushioned when large equipment passes over it. Your architect will have detailed instructions on the building plans. Construction damage may take a few years to become apparent. Slowly declining trees, even death, happens long after a project is done. Young trees are more resilient than older trees. After the construction is over and the builder has installed basic landscaping already, a licensed arborist can provide mitigation for trees, such as air spading (essentially injecting air into the root zone, ‘blowing up’ the compacted earth). Additionally, you can have your lawn company aerate every year to let more air, water and nutrients percolate into the soil. If you’re planning new construction, we like to come in and “fluff up” the compacted soil - loosening it to at least 12 inches - then we spread high quality top soil. All of this is done BEFORE we create garden beds or lay down seed or sod. If you skip this step, anything we plant may suffer from poor drainage and poor root development. Make sure your contractor is aware of your garden beds! Many will use a tarp built into a framework suspended over plants to catch debris. Make sure to tell them not to leave garbage or anything plastic, metal or vinyl laying on your lawn. The same is true for glass. In warm weather, sections of lawn will die in just fifteen minutes if glass panels are laid out on it in the sun. Make sure all finishers and sub-contractors are told NEVER to dump any liquids such as paint or thinners onto your property or down the storm drain. Another popular practice is to bury cement, ceramic tiles, and other debris in the ground. More than a few times, we have started digging, only to unearth a garbage dump where the garden should be! Before work starts, have a short conversation with your contractor about keeping the property clean. Protect your existing perennial beds. Create a pathway of plywood for workers and deliveries - even heavy work boots can do irreparable damage. Dig up any tender specimens and pot them until ready to replant or replant temporarily in a protected spot. Make sure you have a back up plan to remember what’s planted where, in case your labels are lost. Take photos to document where your beloved shrubs and perennials were planted. Finally, some damage is inevitable, even if you follow all this advice. Try to look at the result as an opportunity - maybe it’s time to put in a garden path or revisit the idea of a water feature. Let something even more beautiful take the place of what was once there.